The project is an errant cemetery which consists in an archipelago of ephemeral islands of ice. The project considers burial as the last voyage into nature. The project consists in an archipelago of wandering icebergs where the coffins or the urns are inserted. The icebergs will wander across the ocean with no fixed route. While the ice melts, the urns or coffins will sink into the sea and lay on an undetermined point of the sea bed for all eternity. The artificial iceberg is made up of an artificial floating structure substituting the enormous mass of ice under sea level which usually raises and supports the top of a natural iceberg. The coffins are arranged inside in a geometric grid; their black color and geometric arrangement contrast with the organic natural form of the iceberg. The final ice ship is 12-15 metres long and 3-4 meters high, and is made up of 90-100 m3 of ice. 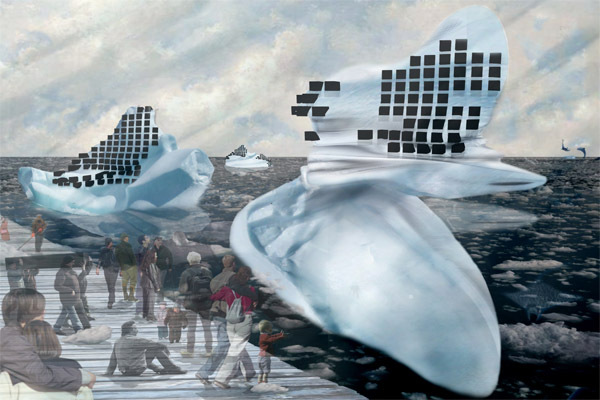 The project takes its inspiration from the utopian military project Habbakuk”, an unsinkable aircraft carrier made of ice and Pykrete (ice + sawdust), proposed by the British during World War II. From war to burials, the itinerant cemetery proposes a novel and interesting synergy between natural and artificial elements which transforms and reconstructs the concept of burial as the last voyage into nature. leonardo zuccaro marchi (camposampietro – pd, 1983) ha il suo studio a padova.